Предлагаем к чтению аннотацию, описание, краткое содержание или предисловие (зависит от того, что написал сам автор книги «Survival of the Sparrows»). Если вы не нашли необходимую информацию о книге — напишите в комментариях, мы постараемся отыскать её. What will you do when the United States is invaded? In the near future, six multinational armies of half a million Russian, North Korean, and Middle-Eastern soldiers launch a coordinated offensive, invading the United States with unparalleled precision. They call themselves the People’s Liberating Army — the PLA. May and Winston Sparrow live on the route that the PLA is taking on its way to sack Atlanta. 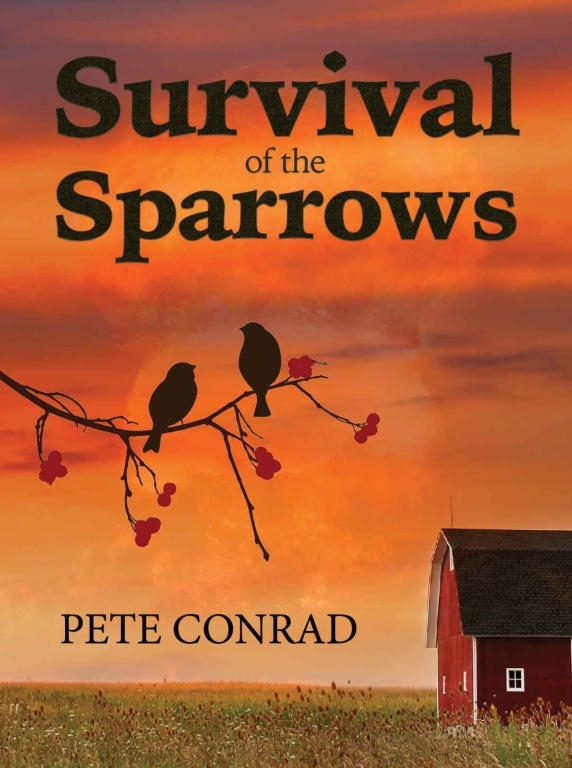 The Sparrows, married for fifty years, don’t intend to flee the imminent invasion. Like many others in the tiny town of Johnsonville, Georgia, they dig in and make preparations. Winston, a structural engineer by trade, devises a simple strategy — build a false wall in their small barn and wait out the offensive inside the tiny, hidden space. They have supplies and water to last for two weeks, but to Winston and May’s horror, instead of just passing through, the PLA chooses the Sparrow property as their headquarters. Their secret sanctuary becomes an unwelcome front row seat to the atrocities of war. When they run out of food and water, Winston has no choice but to leave the spurious safety of the barn and escape the PLA’s fortified defenses. Outside, he finds a new world — sometimes exciting and invigorating, more often brutal and devastating — where he encounters adversaries from near and far. While he is away from May, Winston must defend himself, help those more vulnerable than he, bring closure for old friends, and in an unlikely turn of events, he even befriends an enemy soldier. When things can’t possibly get any worse, and the threat of large-scale annihilation looms, the U.S. Army presses Winston back into military service, forcing him to rely on the skills he honed during the Vietnam War, or risk losing it all. Кто написал Survival of the Sparrows? Узнайте фамилию, как зовут автора книги и список всех его произведений по сериям. Ниже представлен текст книги, разбитый по страницам. Система автоматического сохранения места последней прочитанной страницы, позволяет с удобством читать онлайн бесплатно книгу «Survival of the Sparrows», без необходимости каждый раз заново искать на чём Вы остановились. Не бойтесь закрыть страницу, как только Вы зайдёте на неё снова — увидите то же место, на котором закончили чтение. The southern live oak that had given great comfort, shelter, and shade to May Wellbeloved’s family for four generations had died five years ago, having succumbed to oak wilt. It was a fast-spreading disease that took the imposing tree in just one season. May mourned the loss of that tree as she peered out of the back screen door of the white colonial house her great-grandfather built with his own hands in 1904. She blamed herself for not catching the fungus sooner — for not noticing that the spotted leaves were dropping in mid-summer when the tree should have been producing flowers and nuts — for forgetting that its foliage should have been the same deep hue of mossy green that she had treasured for the past sixty-six years she had known the tree — for letting her ancestors down. That tree had protected her family from the hot Georgia midday sun and from several hurricanes for one hundred twenty years. Now, it was gone; the spot it had shaded replaced by a lush and verdant green lawn, the tree’s wide and glorious trunk the sole remnant for May’s imagination. Her father had said the tree was over three hundred years old. He had a habit of divulging that fact, as if it were top-secret information, to everyone who visited the rural two-acre Johnsonville, Georgia property. May’s father was Johnsonville’s first black mayor, serving the small community of less than a thousand inhabitants from 1970 to 1988, when he died of a stroke at the age of fifty-four. Mayor Wellbeloved was truly well beloved by all. He was an honest, stern, and demanding man who expected the residents of Johnsonville to behave with the same reverent morality and social dignity that he demonstrated as their mayor. Mayor Wellbeloved also expected these qualities of May, his only child. In fact, the residents of Johnsonville still spoke highly of Mayor Wellbeloved some thirty-odd years after his passing — and equally of the barbecue he hosted for the community under the colossal oak tree. That barbecue was such a successful event that by 1975 it was held annually over the long three-day Labor Day weekend. Most Johnsonville residents attended the barbecue, with invitations and RSVPs sent out a month earlier requesting their preference for which day they were to attend — Saturday, Sunday, or Monday. May gazed through the screened door onto the sprawling lawn where the live oak had for so long spread its enormously thick limbs out over the pristine, spring-fed Robin Lake. She reminisced about when she was a teenager hanging on the twisted rope swing that once dangled from one of the tree’s abundant and strong boughs. Oh, how she adored to climb up the two-by-four ladder her father had nailed to the wide trunk, grab hold of the rope, push herself off, and gather more and more speed and height with each oscillation until she built up the nerve to let go and fly. May would squeal with a nervous laughter that children often masked their fear with as she splashed down into the lake’s clear and cold water. She continued to lumber up the side of the tree and swing into Robin Lake, right on up until it was felled when May was well into her sixties. She still shrieked with delightful fright each time she let go of the rope, because sometimes fear feels good, and often forces people to appreciate the life they have been given. When she was thirteen years old, May named the southern live oak tree “Medusa” for the way the tree’s sprawling limbs reminded her of the mythological creature’s writhing head of snakes that she was reading about in The Golden Fleece in her eighth-grade English class. The unfortunate coincidence about naming the tree Medusa was that May wore her hair in neat rows of nappy-chic Bantu knots, and her father was all too keen to use the Medusa moniker on her as well. May rested her graying head of hair, still tied into Bantu knots, against the screen and smiled as she recalled Mayor Wellbeloved calling her Medusa in that soft, southern gentry accent of his: Yo’ homework done, M’dusa? You gon’ scare them boys ‘way with that M’dusa head a hair a yours, he’d say. And then he’d howl exuberantly as if he had delivered the cleverest joke ever told in southern Georgia on any bright, blue-skied day. Medusa was a nickname May hated to be called then, but that she now longed to hear spoken from the Mayor’s lips. How she wanted him to call her Medusa one last time. What May most admired about The Golden Fleece was Perseus’ boundless courage. Perseus was the ultimate hero — courageous, clever, tenacious, and exceedingly handsome. He was a man who would do anything for love, including slaying the sea monster, Cetus, to save his beloved Andromeda from certain death. Her Perseus, her husband Winston, was seated at Medusa’s wide stump, drinking black coffee out of a mug inscribed with “I’m a Grouch,” scribbling down simple architectural plans on an old grocery list. Medusa’s stump was glorious, measuring twenty feet in circumference, and when Scotty Highland and his crew from the local mill felled the tree, Winston was adamant that the stump be planed level, exactly thirty-three inches tall, so he and May could continue to celebrate the tree’s gift in the form of an outdoor table. Winston went as far as painstakingly covering the stump with a half-inch-thick coat of clear epoxy to seal and beautify the wood, and before he laid down the sealant, May covered the top of the stump with photos and memories honoring the tree’s life: Mayor Wellbeloved with an assortment of family and friends at his annual barbecue, her as a child climbing up the ladder to the swing, a Gone with the Wind thirty-year commemorative flyer, and several photos of her and Winston under the tree. Now, four comfortable, padded chairs encircled the stump that was still the main focal point of the backyard. May let the screen door slam behind her as she walked toward Winston, coffee pot in hand. The sun was just stealing above the southern pines across the lake, giving light and warmth to the entropy that was slowly creeping into Johnsonville. “I thought you didn’t write plans down, Mister I got it all right up in here?” May said, as she tapped mockingly on her skull while simultaneously kissing Winston on the crown of his head. She refreshed his half-filled coffee mug and plopped in the chair closest to him. “Jes’ tryin’ ta work it all out, May,” Winston said, not looking up, but setting down his ruler and bringing the hot coffee to his lips. He wore an expression of anxiety on his face, which wasn’t natural for him. He was always May’s rock — the foundation on which her life was securely fastened, and a man who feared little. Or so it seemed, but not today. Winston sometimes called May “Mother” because of the long line of blue tabbies she’d cared for since getting married. May loved every one of her cats, but Winston was indifferent to them. Amadeus, their twelve-year-old cat, was the only one left now. He was kicking around the property somewhere, most likely tormenting a defenseless chipmunk or salamander. Independent and easily agitated, Amadeus was not a friend to Winston — the cat wouldn’t so much as let Winston touch him. Still, Amadeus was the only “child” May and Winston shared together, regardless if he and the cat liked one another. Представляем Вашему вниманию похожие книги на «Survival of the Sparrows» списком для выбора. Мы отобрали схожую по названию и смыслу литературу в надежде предоставить читателям больше вариантов отыскать новые, интересные, ещё не прочитанные произведения. Обсуждение, отзывы о книге «Survival of the Sparrows» и просто собственные мнения читателей. Оставьте ваши комментарии, напишите, что Вы думаете о произведении, его смысле или главных героях. Укажите что конкретно понравилось, а что нет, и почему Вы так считаете.